This month, Microsoft announced that its news portal and the 34th most visited website globally, MSN, is to receive a biggest revamp in 20 years. In this article, I will outline what the makeover entails and why it is needed, as well as offer my perspective on the objective behind it and, most importantly, whether it will be a success? Whilst MSN claims to engage with an audience of 425 million people across 50 countries and 40% of UK internet audiences on a monthly basis, the last 12 months have not been pretty from Microsoft’s perspective. According to web measurement tool Alexa, traffic has stagnated to the extent that MSN has dropped three positions in the global web rankings (from 31st). Even more worryingly however is the drastic decline in visits to the portal from search engine referrals over the same period – from 19% to 3.4%. Instead, MSN maintains a lot of traffic as the default homepage on several versions of Internet Explorer (the second largest global web browser as of June 2014 with a 23% share, according to StatCounter) and from being the standard logout page for other Microsoft products such as Outlook.com. Seemingly aware of this inability to compete, one of MSN’s rebrand features is an abandonment of this goal in favour of a more collaborative offering by signing up 1,300+ content providers, including The Guardian, The Daily Telegraph, The New York Times and CNN, therefore shifting its focus onto offering top content from the web rather than original content. 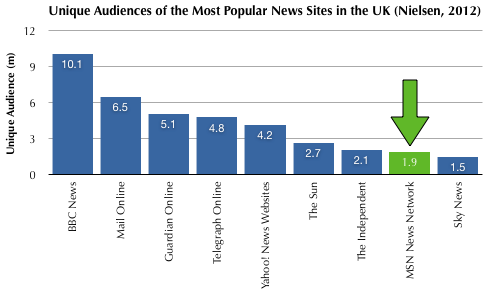 Given this approach and therefore acceptance of the decline in web search referrals, for MSN it is almost no longer a case of differentiation to offer something unique and keep its audience coming back, but interesting enough to stop its audience leaving permanently (by changing their default MSN homepage) – to halt the existing defection in viewership. What is key to point out in Microsoft’s approach is rightly playing to MSN’s strengths in repositioning it as the ‘Perfect Homepage’ by building on automatic traffic from Microsoft products such as Internet Explorer. However, I feel the need to be more critical of the strategic execution – which lacks sustainability in its differentiation. Don’t get me wrong, creating a hub that combines easy access to personal productivity tools and content from a large number of providers does differentiate MSN from the likes of Guardian Online and BBC News, but lacks any authenticity to MSN that is not easily replicable. To build upon this point, there is still something missing that would enable MSN to stand out from the crowd – instead, competitors will inevitably cherry pick the “actionable items” that they see fit to replicate on their own sites and force MSN back to square one. In this age of user-generated content and customer engagement through social media, I would be inclined to differentiate MSN as the ‘Conversation King’ of online news through a focus on community-building to encourage conversation and debate on news content from across the web. In doing so, MSN would become more than simply a bundle of content from other providers, but would actually add its own value through comments, conversations and debates between its own online community that can be enjoyed by other members and site visitors. Not only are virtual communities an innovative tool for attracting, retaining and maintaining strong and valuable relationships with the consumer (Wang & Chi-Feng, 2011), a study by Packard et al. in 2012 showed that increased involvement of members of a company’s online community spend results in more time spent on the website compared to non-members – hence driving traffic. As it stands however, I am dubious of the attempt to reignite MSN as a news portal and instead see it as an execution that will do little more than stem the rapid decline in readership. 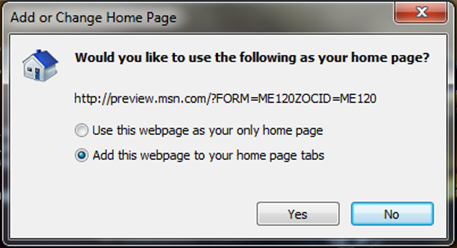 Even as a personalised homepage, I see a flaw in the lack of facility to remove specific content providers from appearing on MSN – with individual functionality limited to selecting which categories are visible and in what order; far from the ‘Perfect Homepage’. Looking at the success of Twitter as a primary news source is proof that consumers respond well to this control over exactly who delivers their news. Overall, I have come to the conclusion that Microsoft is content for MSN to continue piggy-backing off the success of other Microsoft products that forward traffic directly to MSN, rather than seeking adding anything new or distinctive itself. Perhaps you have a different view? Let me know your thoughts on the strategy for MSN and its potential success. This entry was posted in E-Marketing and tagged Differentiation, Internet Explorer, Microsoft, MSN, Outlook, Repositioning, USP. Bookmark the permalink.